DO-20250-00 was succesfully added to your cart. USB cable, software CD, canvas carrying case, three AAA batteries, and NIST-traceable calibration report with data supplied by InnoCal. How much is the annual calibration check for this equipment? The annual calibration is item #17000-27. 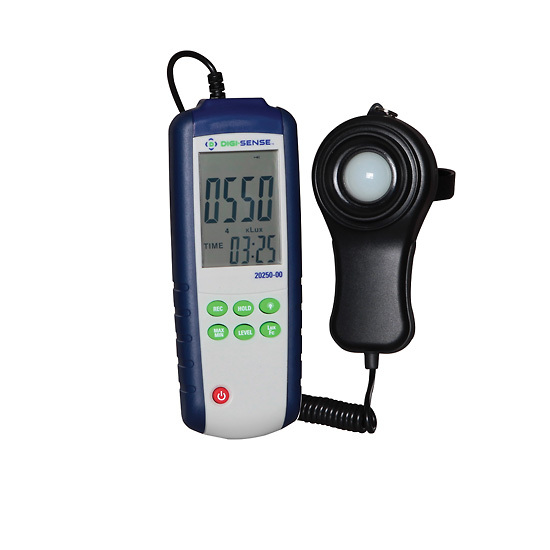 We would like to purchase light meter with NIST Traceable Calibration. I found that it is recommended to send back to InnoCal for annual checking. However when I check the scope of InnoCal, it seems the accredited scope from InnoCal do not include any measurement for lux meter. Would you confirm that InnoCal can provide measurement service for lux meter. The certification supplied with the unit is not accredited, it is traceable to NIST. For an accredited certificate, the meter must be ordered with the 17101-44 certificate and 17100-03 accreditation. Will this meter measure light from LED fixtures? This meter will measure any visible light source. What is the diameter of the light aperture? Measurements made for the ANSI FL1 Flashlight Performance Standard require a 100mm^2 surface area of the aperture. Does this instrument meet that requirement? The aperture diameter is not applicable for our 20250-00 light meter due to it being an incident light meter and that the photocell collects light from all different angles. If you are referring to the external sensor lens (the white capped sensor) then that would be 1” in diameter. Light is collected in this sensor at angle ranges from 0 to 180 degrees.